Posted by Anna on Aug. 3, 2018 in RVing on a Budget. Last update on Aug. 9, 2018 . RVing can work for almost any budget. You can buy a brand new diesel pusher bus for half a million dollars… or you can buy a used pop-up trailer for $1000 and tow it with the family minivan. 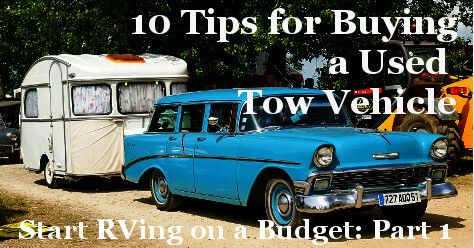 If you’re looking to get started RVing on a budget, then a trailer will definitely be your cheapest option, but if you don’t currently own something that you can tow a trailer with, buying a second hand tow vehicle may also be in the cards.